Window is similar to Buffer, but rather than emitting packets of items from the source Observable, it emits Observables, each one of which emits a subset of items from the source Observable and then terminates with an onCompleted notification. Like Buffer, Window has many varieties, each with its own way of subdividing the original Observable into the resulting Observable emissions, each one of which contains a “window” onto the original emitted items. In the terminology of the Window operator, when a window “opens,” this means that a new Observable is emitted and that Observable will begin emitting items emitted by the source Observable. 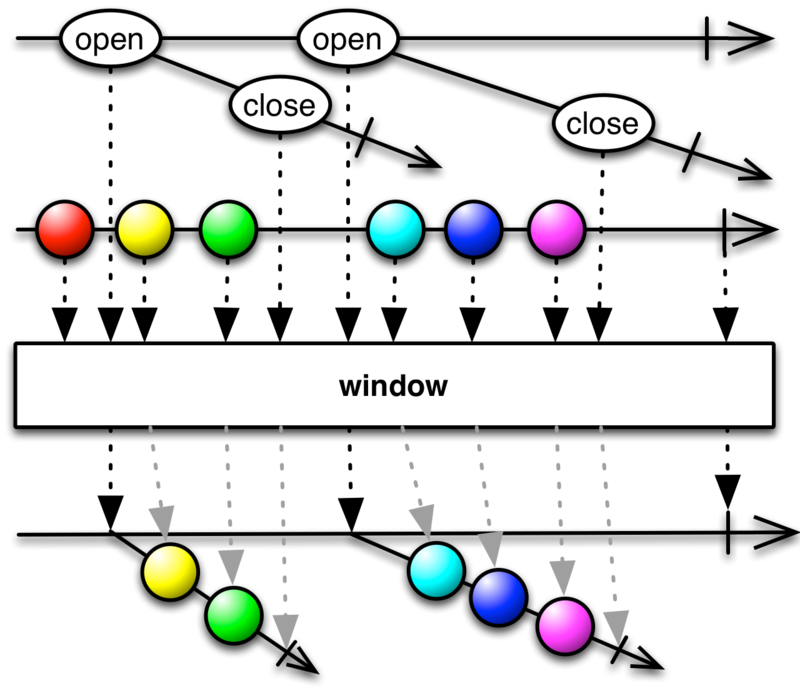 When a window “closes,” this means that the emitted Observable stops emitting items from the source Observable and terminates with an onCompleted notification to its observers. partition-all opens its first window immediately. It opens a new window beginning with every step item from the source Observable (so, for example, if step is 3, then it opens a new window starting with every third item). It closes each window when that window has emitted n items or if it receives an onCompleted or onError notification from the source Observable. If step = n (which is the default if you omit the step parameter) then the window size is the same as the step size and there will be a one-to-one correspondence between the items emitted by the source Observable and the items emitted by the collection of window Observables. 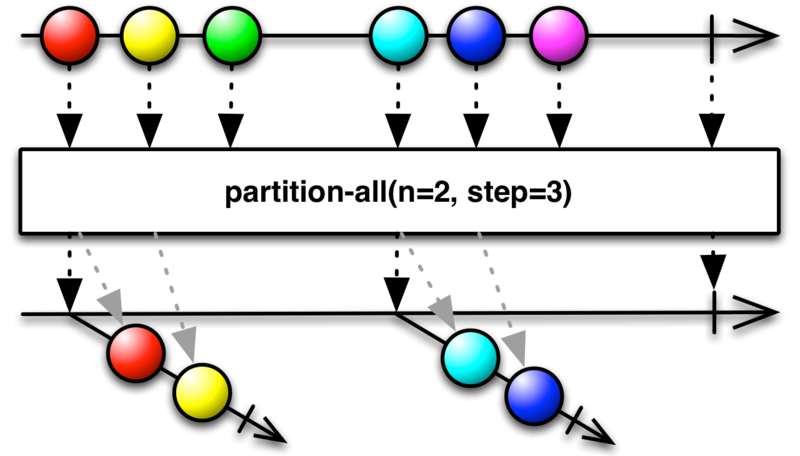 If step < n the windows will overlap by n − step items; if step > n the windows will drop step − n items from the source Observable between every window. This variant of window opens its first window immediately. It closes the currently open window and immediately opens a new one whenever the current window has emitted count items. It will also close the currently open window if it receives an onCompleted or onError notification from the source Observable. 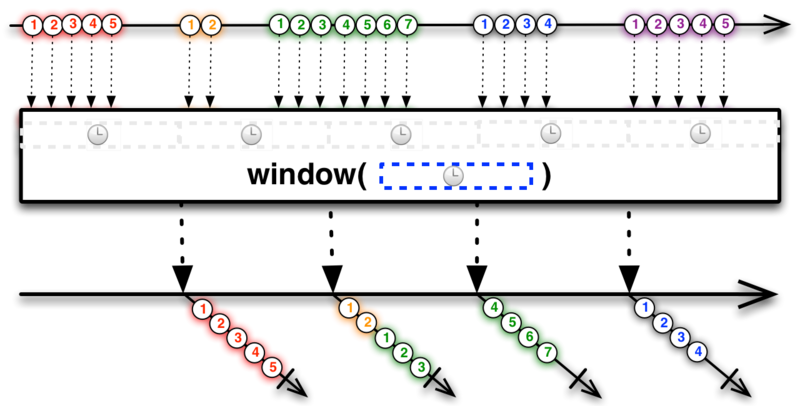 This variant of window emits a series of non-overlapping windows whose collective emissions correspond one-to-one with those of the source Observable. This variant of window opens its first window immediately. It opens a new window beginning with every skip item from the source Observable (so, for example, if skip is 3, then it opens a new window starting with every third item). It closes each window when that window has emitted count items or if it receives an onCompleted or onError notification from the source Observable. If skip = count then this behaves the same as window(source, count); if skip < count this will emit windows that overlap by count − skip items; if skip > count this will emit windows that drop skip − count items from the source Observable between every window. This variant of window_with_time opens its first window immediately. 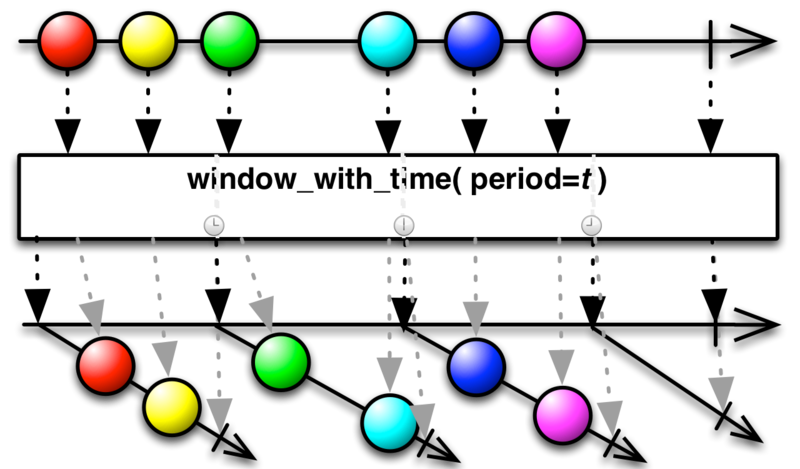 It closes the currently open window and opens another one every period of time (a Duration, optionally computed by a given Coordination). It will also close the currently open window if it receives an onCompleted or onError notification from the source Observable. This variant of window_with_time emits a series of non-overlapping windows whose collective emissions correspond one-to-one with those of the source Observable. This variant of window_with_time opens its first window immediately. It closes the currently open window after period amount of time has passed since it was opened, and opens a new window after skip amount of time has passed since the previous window was opened (both times are Durations, optionally computed by a given Coordination). It will also close the currently open window if it receives an onCompleted or onError notification from the source Observable. 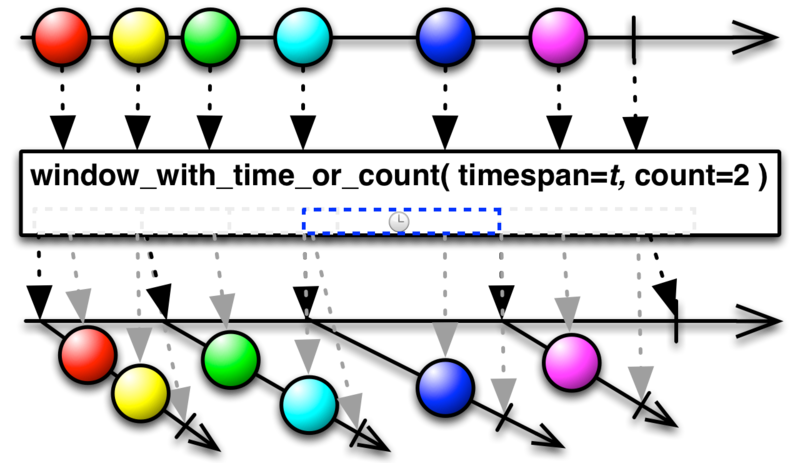 This variant of window_with_time may emit windows that overlap or that have gaps, depending on whether skip is less than or greater than period. window_with_time_or_count opens its first window immediately. 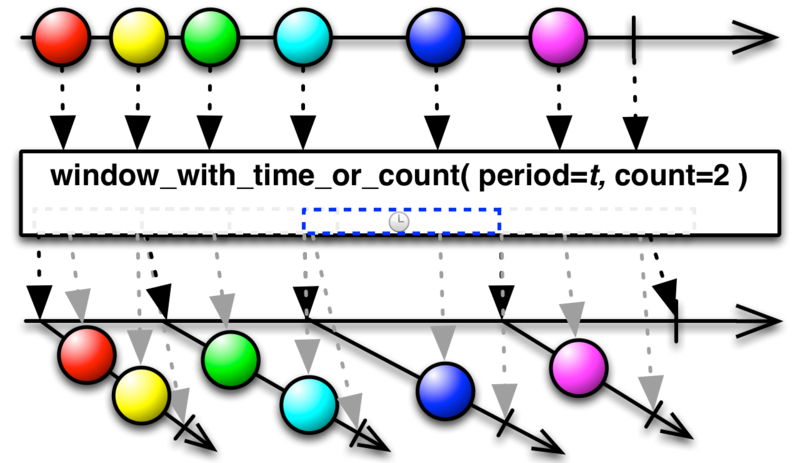 It closes the currently open window and opens another one every period of time (optionally computed by a given Coordination) or whenever the currently open window has emitted count items. It will also close the currently open window if it receives an onCompleted or onError notification from the source Observable. 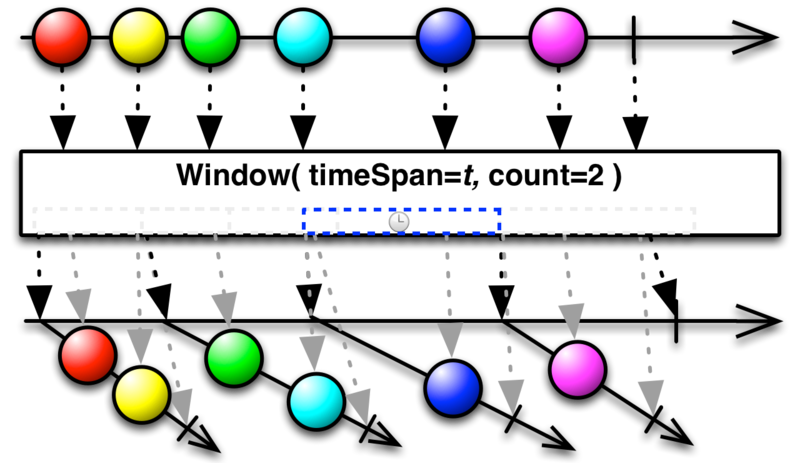 window_with_time_or_count emits a series of non-overlapping windows whose collective emissions correspond one-to-one with those of the source Observable. 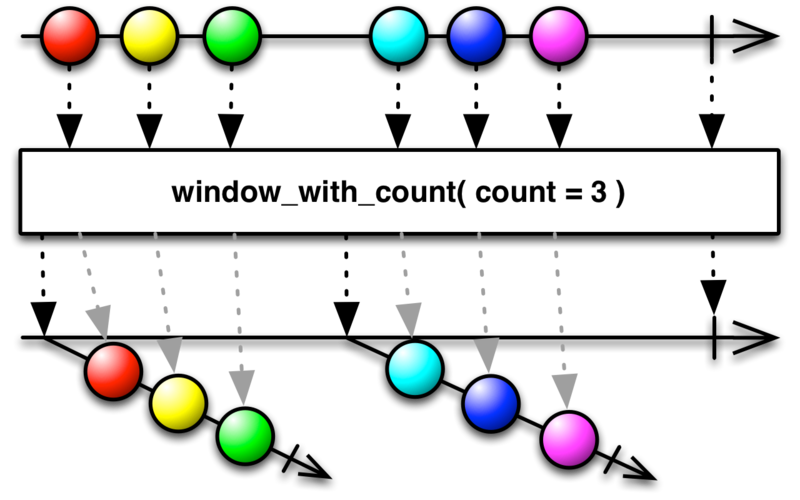 There are several varieties of Window in RxGroovy. This variant of window opens its first window immediately. It closes the currently open window and immediately opens a new one each time it observes an object emitted by the Observable that is returned from closingSelector. In this way, this variant of window emits a series of non-overlapping windows whose collective emissions correspond one-to-one with those of the source Observable. This variant of window opens a window whenever it observes the windowOpenings Observable emit an Opening object and at the same time calls closingSelector to generate a closing Observable associated with that window. When that closing Observable emits an object, window closes that window. Since the closing of currently open windows and the opening of new windows are activities that are regulated by independent Observables, this variant of window may create windows that overlap (duplicating items from the source Observable) or that leave gaps (discarding items from the source Observable). This variant of window opens its first window immediately. 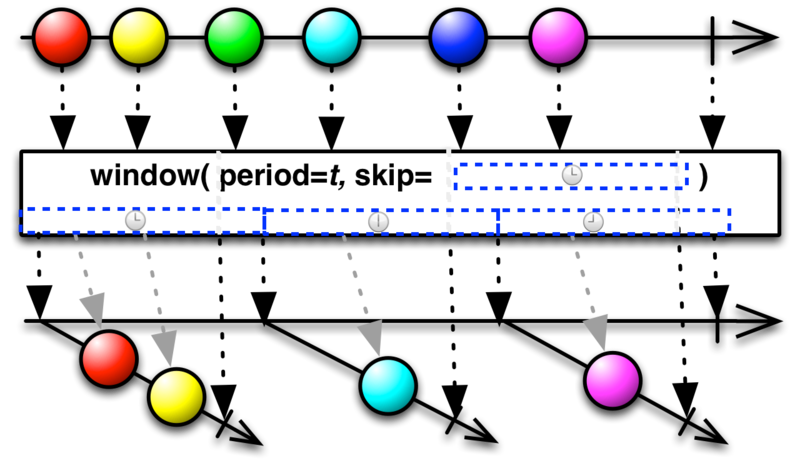 It closes the currently open window and opens another one every timespan period of time (measured in unit, and optionally on a particular Scheduler). It will also close the currently open window if it receives an onCompleted or onError notification from the source Observable. This variant of window emits a series of non-overlapping windows whose collective emissions correspond one-to-one with those of the source Observable. If you do not specify a Scheduler, this variant of window uses the computation Scheduler for its timer by default. This variant of window opens its first window immediately. It closes the currently open window and opens another one every timespan period of time (measured in unit, and optionally on a particular Scheduler) or whenever the currently open window has emitted count items. It will also close the currently open window if it receives an onCompleted or onError notification from the source Observable. 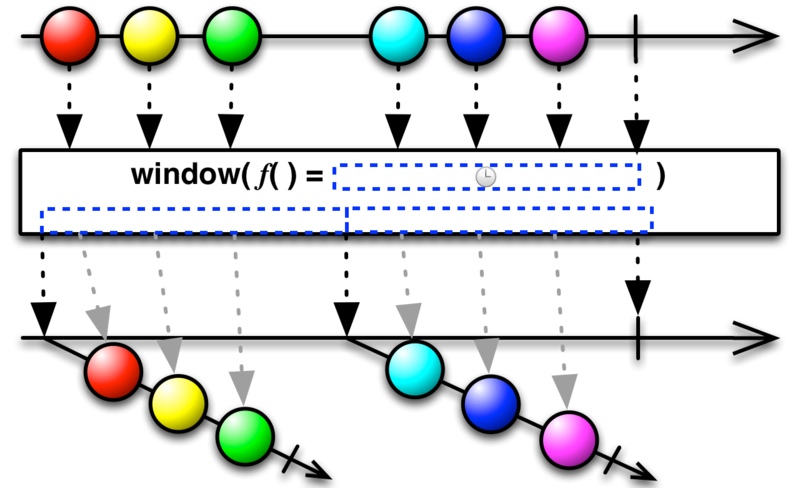 This variant of window emits a series of non-overlapping windows whose collective emissions correspond one-to-one with those of the source Observable. 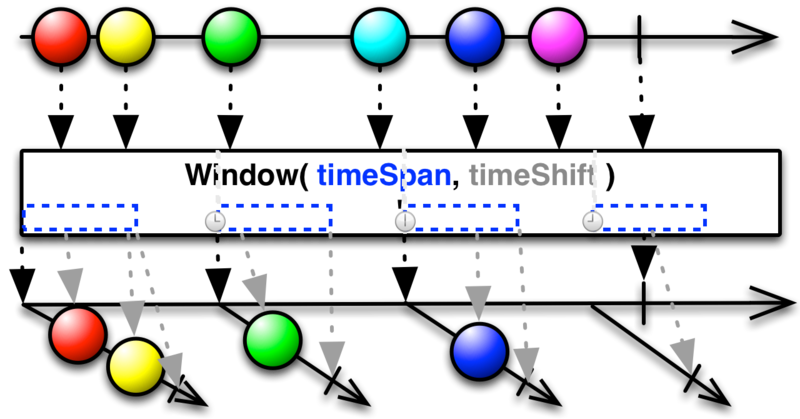 This variant of window opens its first window immediately, and thereafter opens a new window every timeshift period of time (measured in unit, and optionally on a particular Scheduler). It closes a currently open window after timespan period of time has passed since that window was opened. It will also close any currently open window if it receives an onCompleted or onError notification from the source Observable. Depending on how you set timespan and timeshift the windows that result from this operation may overlap or may have gaps. You can use the Window operator to implement backpressure (that is, to cope with an Observable that may produce items too quickly for its observer to consume). Window can reduce a sequence of many items to a sequence of fewer windows-of-items, making them more manageable. You could, for example, emit a window of items from a bursty Observable periodically, at a regular interval of time. Or you could choose to emit a new window of items for every n items emitted by the bursty Observable. There are several varieties of Window in RxJava. This variant of window takes a second Observable as a parameter. Whenever this second Observable emits an item, window closes the current Observable window (if any) and opens a new one. This variant of windowWithCount opens its first window immediately. It closes the currently open window and immediately opens a new one whenever the current window has emitted count items. It will also close the currently open window if it receives an onCompleted or onError notification from the source Observable. This variant of windowWithCount emits a series of non-overlapping windows whose collective emissions correspond one-to-one with those of the source Observable. This variant of windowWithCount opens its first window immediately. It opens a new window beginning with every skip item from the source Observable (so, for example, if skip is 3, then it opens a new window starting with every third item). It closes each window when that window has emitted count items or if it receives an onCompleted or onError notification from the source Observable. 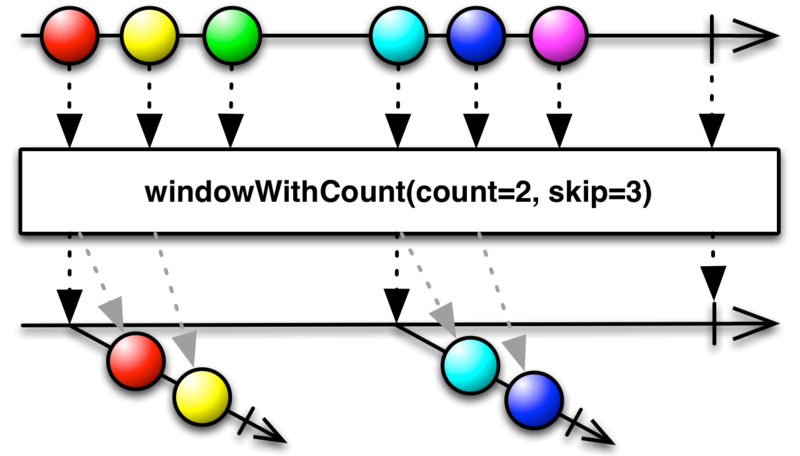 If skip = count then this behaves the same as windowWithCount(count); if skip < count this will emit windows that overlap by count − skip items; if skip > count this will emit windows that drop skip − count items from the source Observable between every window. This variant of windowWithTime opens its first window immediately. It closes the currently open window and opens another one every timespan period of time (in milliseconds, optionally measured on a particular Scheduler). It will also close the currently open window if it receives an onCompleted or onError notification from the source Observable. This variant of windowWithTime emits a series of non-overlapping windows whose collective emissions correspond one-to-one with those of the source Observable. If you do not specify a Scheduler, this variant of windowWithTime uses the timeout Scheduler for its timer by default. 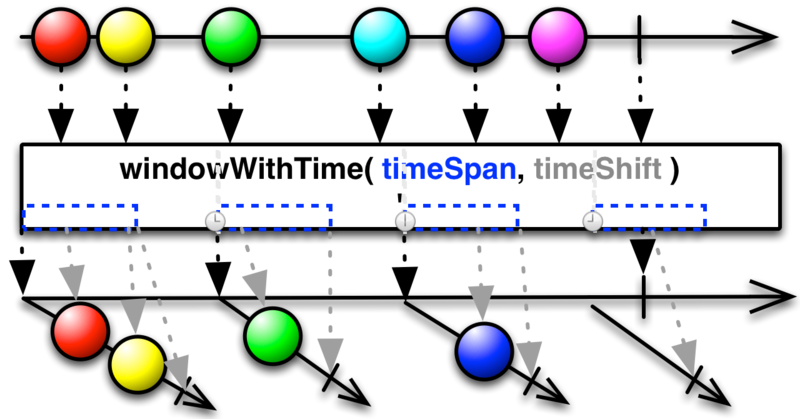 This variant of windowWithTime opens its first window immediately, and thereafter opens a new window every timeshift milliseconds (optionally measured on a particular Scheduler). It closes a currently open window after timespan milliseconds have passed since that window was opened. It will also close any currently open window if it receives an onCompleted or onError notification from the source Observable. Depending on how you set timespan and timeshift the windows that result from this operation may overlap or may have gaps. windowWithTimeOrCount opens its first window immediately. It closes the currently open window and opens another one every timespan milliseconds (optionally measured on a particular Scheduler) or whenever the currently open window has emitted count items. It will also close the currently open window if it receives an onCompleted or onError notification from the source Observable. 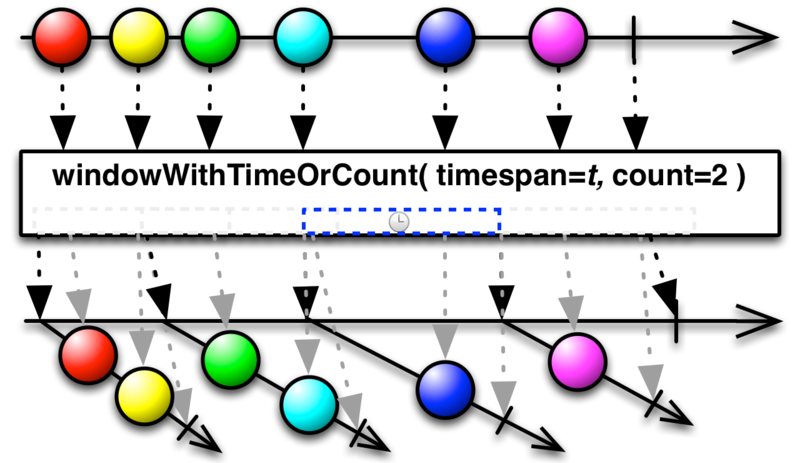 windowWithTimeOrCount emits a series of non-overlapping windows whose collective emissions correspond one-to-one with those of the source Observable. If you do not specify a Scheduler, this variant of windowWithTimeOrCount uses the timeout Scheduler for its timer by default. There are several varieties of Window in RxKotlin. There are several variants of the Window operator in Rx.NET. This variant of Window opens its first window immediately and calls the windowClosingSelector function to obtain a second Observable. Whenever this second Observable emits a TWindowClosing object, Window closes the currently open window, and immediately opens a new one. It repeats this process until either Observable terminates. In this way, this variant of Window emits a series of non-overlapping windows whose collective emissions correspond one-to-one with those of the source Observable, until the closing selector observable terminates. This variant of Window opens its first window immediately. 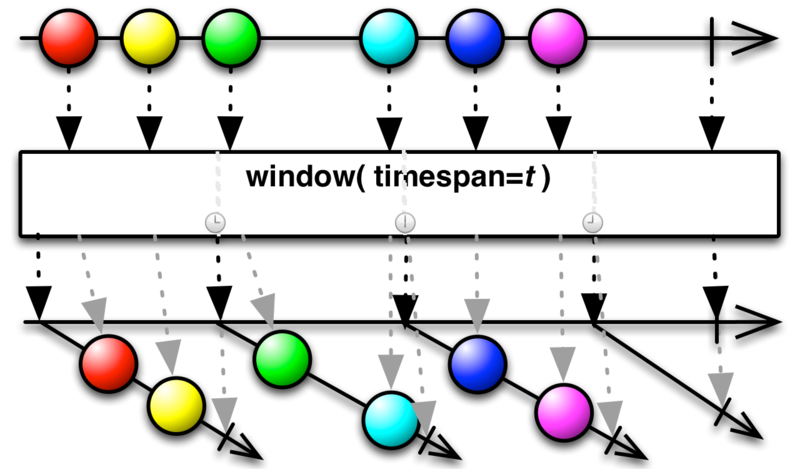 It closes the currently open window and opens another one every timespan period of time (in the form of a TimeSpan object, and optionally on a particular IScheduler). It will also close the currently open window if it receives an onCompleted or onError notification from the source Observable. 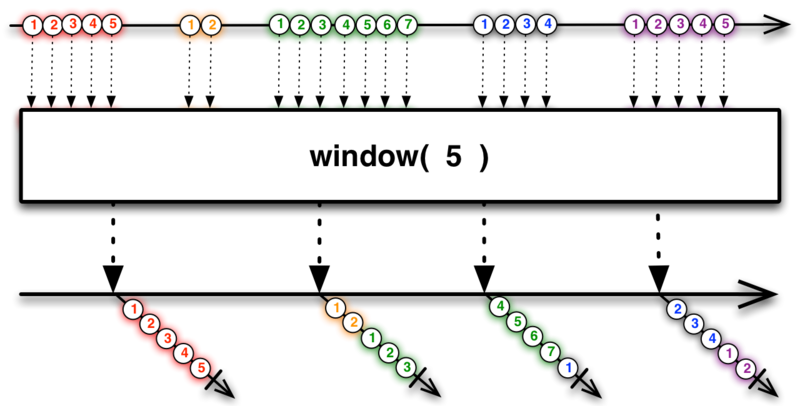 This variant of Window emits a series of non-overlapping windows whose collective emissions correspond one-to-one with those of the source Observable. This variant of Window opens a window whenever it observes the windowOpenings Observable emit an TWindowOpening object and at the same time calls the windowClosingSelector, passing it that TWindowOpening object, to generate a closing Observable associated with that window. When that closing Observable emits a TWindowClosing object, Window closes the associated window. 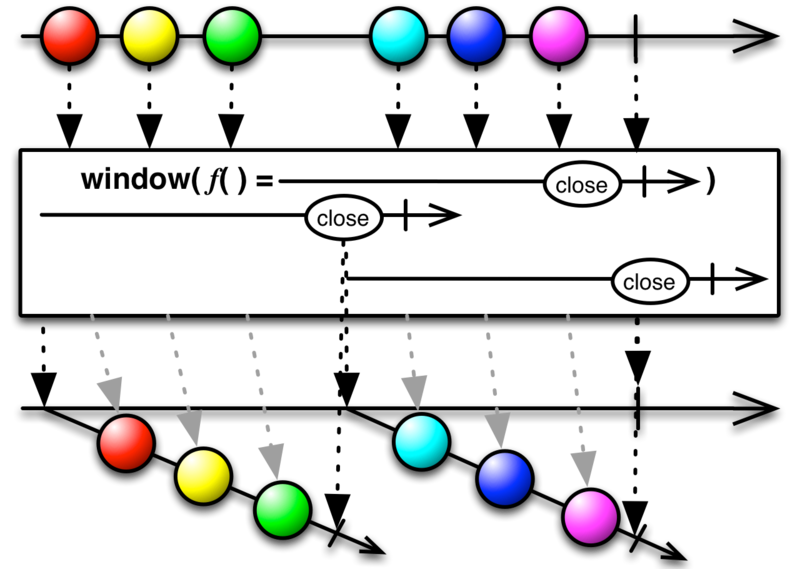 Since the closing of currently open windows and the opening of new windows are activities that are regulated by independent Observables, this variant of Window may create windows that overlap (duplicating items from the source Observable) or that leave gaps (discarding items from the source Observable). This variant of Window opens its first window immediately. It closes the currently open window and opens another one every timeSpan period of time (in the form of a TimeSpan object, and optionally on a particular IScheduler) or whenever the currently open window has emitted count items. It will also close the currently open window if it receives an onCompleted or onError notification from the source Observable. This variant of window emits a series of non-overlapping windows whose collective emissions correspond one-to-one with those of the source Observable. This variant of Window opens its first window immediately, and thereafter opens a new window every timeShift period of time (in the form of a TimeSpan object, and optionally on a particular IScheduler). It closes a currently open window after timeSpan period of time has passed since that window was opened. It will also close any currently open window if it receives an onCompleted or onError notification from the source Observable. Depending on how you set timeSpan and timeShift the windows that result from this operation may overlap or may have gaps. RxPY implements this operator with several variants of four different functions. This variant of window opens its first window immediately and calls the closing_selector function to obtain a second Observable. When this second Observable emits an item, window closes the currently open window, immediately opens a new one, and again calls the closing_selector function to obtain a fresh Observable. It repeats this process until the source Observable terminates. 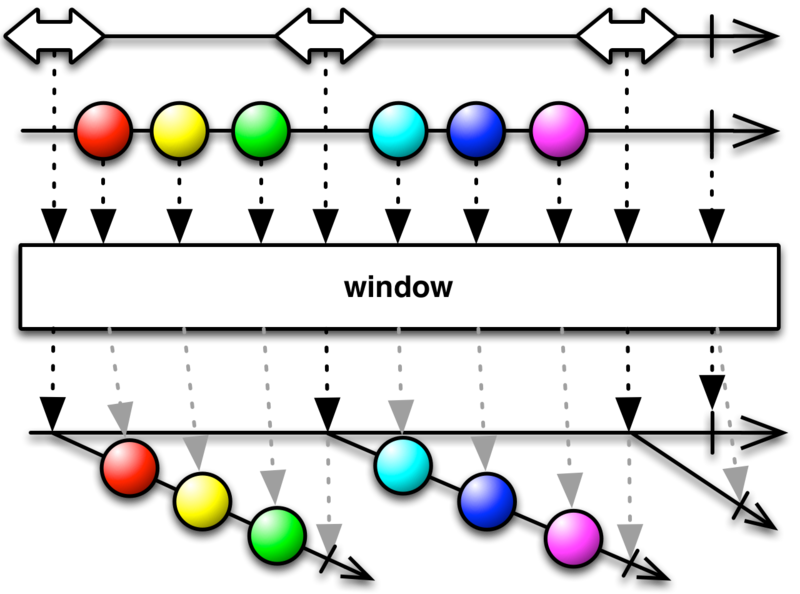 In this way, this variant of window emits a series of non-overlapping windows whose collective emissions correspond one-to-one with those of the source Observable. This variant of window opens a window whenever it observes the window_openings Observable emit an item, and at the same time calls closing_selector to generate a closing Observable associated with that window. When that closing Observable emits an object, window closes that window. 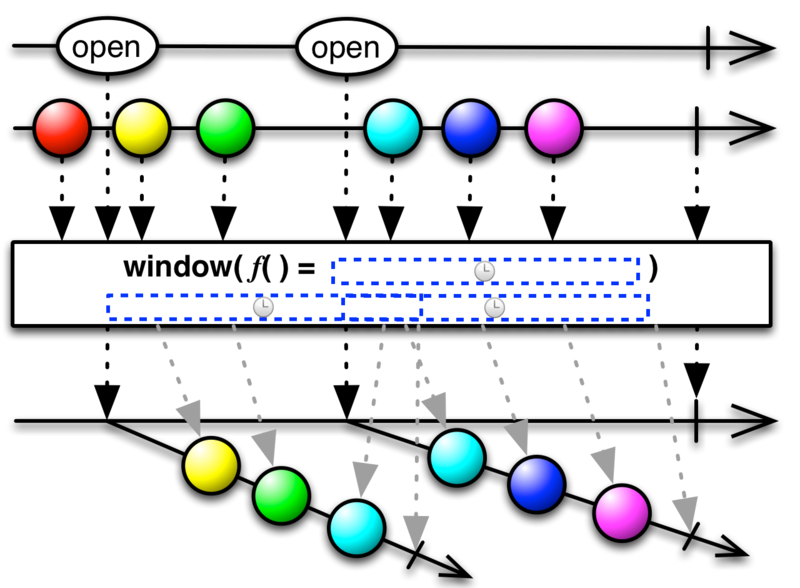 Since the closing of currently open windows and the opening of new windows are activities that are regulated by independent Observables, this variant of window may create windows that overlap (duplicating items from the source Observable) or that leave gaps (discarding items from the source Observable). This variant of window_with_count opens its first window immediately. It closes the currently open window and immediately opens a new one whenever the current window has emitted count items. It will also close the currently open window if it receives an onCompleted or onError notification from the source Observable. This variant of window_with_count emits a series of non-overlapping windows whose collective emissions correspond one-to-one with those of the source Observable. This variant of window_with_count opens its first window immediately. It opens a new window beginning with every skip item from the source Observable (so, for example, if skip is 3, then it opens a new window starting with every third item). It closes each window when that window has emitted count items or if it receives an onCompleted or onError notification from the source Observable. If skip = count then this behaves the same as window_with_count(count); if skip < count this will emit windows that overlap by count − skip items; if skip > count this will emit windows that drop skip − count items from the source Observable between every window. This variant of window_with_time opens its first window immediately. It closes the currently open window and opens another one every timespan milliseconds (optionally measured on a particular Scheduler). It will also close the currently open window if it receives an onCompleted or onError notification from the source Observable. This variant of window_with_time emits a series of non-overlapping windows whose collective emissions correspond one-to-one with those of the source Observable. If you do not specify a Scheduler, this variant of window_with_time uses the timeout Scheduler for its timer by default. window_with_time_or_count opens its first window immediately. It closes the currently open window and opens another one every timespan milliseconds (optionally measured on a particular Scheduler) or whenever the currently open window has emitted count items. It will also close the currently open window if it receives an onCompleted or onError notification from the source Observable. 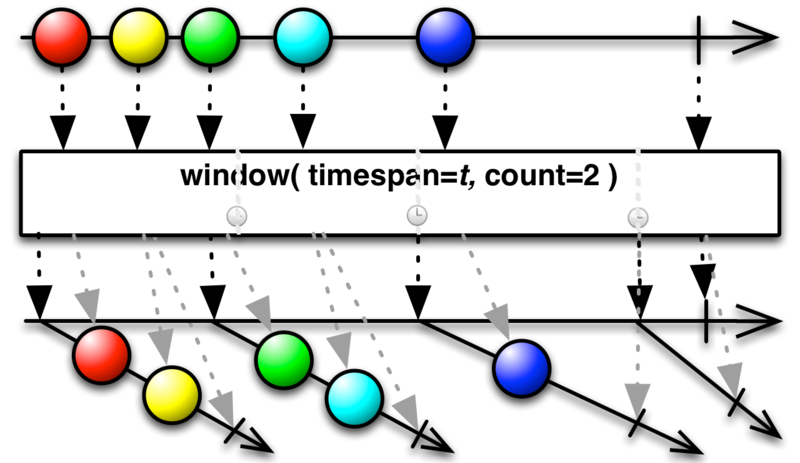 window_with_time_or_count emits a series of non-overlapping windows whose collective emissions correspond one-to-one with those of the source Observable. If you do not specify a Scheduler, this variant of window_with_time_or_count uses the timeout Scheduler for its timer by default. Rx.rb implements this operator as window_with_count. It opens its first window immediately. It then opens a new window beginning with every skip item from the source Observable (so, for example, if skip is 3, then it opens a new window starting with every third item). It closes each window when that window has emitted count items or if it receives an onCompleted or onError notification from the source Observable. If skip = count then there is a one-to-one correspondence between the items emitted by the source Observable and those emitted by the window Observables; if skip < count the windows will overlap by count − skip items; if skip > count the windows will drop skip − count items from the source Observable between every window. RxScala implements this operator as sliding (creates windows that may overlap or have gaps) and tumbling (creates windows whose collective emissions match those of the source Observable one-to-one). This variant of sliding opens its first window immediately, and thereafter opens a new window every timeshift period of time (in the form of a Duration object, and optionally on a particular Scheduler). It closes a currently open window after timespan period of time has passed since that window was opened or once count items have been emitted on that window. It will also close any currently open window if it receives an onCompleted or onError notification from the source Observable. This variant of sliding opens its first window immediately, and thereafter opens a new window every timeshift period of time (in the form of a Duration object, and optionally on a particular Scheduler). It closes a currently open window after timespan period of time has passed since that window was opened. It will also close any currently open window if it receives an onCompleted or onError notification from the source Observable. This variant of sliding opens its first window immediately. It opens a new window beginning with every skip item from the source Observable (so, for example, if skip is 3, then it opens a new window starting with every third item). It closes each window when that window has emitted count items or if it receives an onCompleted or onError notification from the source Observable. 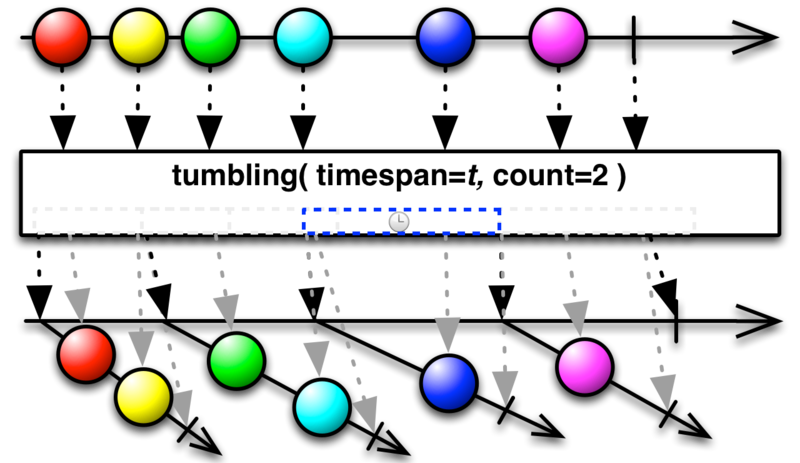 If skip = count then this behaves the same as tumbling(count); if skip < count this will emit windows that overlap by count − skip items; if skip > count this will emit windows that drop skip − count items from the source Observable between every window. This variant of sliding opens a window whenever it observes the openings Observable emit an Opening object and at the same time calls closings to generate a closing Observable associated with that window. When that closing Observable emits an item, sliding closes that window. This variant of tumbling opens its first window immediately. It closes the currently open window and opens another one every timespan period of time (a Duration, optionally measured on a particular Scheduler) or whenever the currently open window has emitted count items. It will also close the currently open window if it receives an onCompleted or onError notification from the source Observable. This variant of tumbling opens its first window immediately. It closes the currently open window and opens another one every timespan period of time (a Duration, optionally measured on a particular scheduler). It will also close the currently open window if it receives an onCompleted or onError notification from the source Observable. This variant of tumbling opens its first window immediately. It closes the currently open window and immediately opens a new one whenever the current window has emitted count items. It will also close the currently open window if it receives an onCompleted or onError notification from the source Observable. This variant of tumbling takes a second Observable as a parameter. Whenever this second Observable emits an item, tumbling closes the current Observable window (if any) and opens a new one.